The hillock on which Myawtawmu pagoda stands, is 100 feet high and two furlongs away from the palace site. Although the original donor was not known exactly, the year of renovation of king Min Pha Laung, must be recorded. The place on which Myawtawmu pagoda stands, is a plateau. The brick wall was made around the plateau and the entrance has porches. The brick stairway is an access to climb the top of the mountain. Kwansee entrance gate can be seen if one views from that place. In Mraukoo period, the soldiers who came back from the war, had to enter the city from only that entrance gate. he pagoda was called Myawtawmu pagoda because the women used to wait for the returning of their husbands, soldiers, to homes from that place. And, it was also the place the women prayed to Buddha by donating light for the victory of the war of their husbands. In the reign of king Min Kha Maung, a zone officer had to live with his family near Myawtawmu pagoda while he was performing his duties at Ponnawtaung fort. Thus, he had to go to the western province for the war. His wife waited for his coming by staying from Myawtawmu pagoda. She called a soldier to follow her as a guard. One day, the zone officer’s wife donated light and flowers to Buddha going to Myawtawmu pagoda together with the soldier. In that time, the zone officer arrived back home from the war at sunset and when he asked the home maid, he knew that his wife went to Myawtawmu pagoda. He went to Myawtawmu pagoda riding the horse because he was so eager to meet his wife. 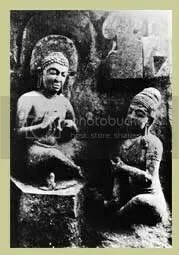 When he got to the pagoda, he found that his wife was sitting together with the soldier in front of the Buddha image and contemplating the arttibutes of Buddha after she had donated light to Buddha image. As the zone officer was so angry at her with misapprehension, he killed his wife and the soldier in the cave without making any enquiry. One week later, his home maid explained him, therefore, he knew reality about his wife. He felt full of remorse, so he built a pagoda near the pagoda in which he killed his wife in order to salvage his sin. Thus, the unfinished pagoda can still be seen until now as there was no donor to continue building the pagoda. The pagoda in which he killed his wife, had already ruined owing to the treasure hunters.